TeamViewer 10 Free Download latest version setup. Help out your friend in sorting out his/her problem remotely or share files between two computer’s easily and safely. TeamViewer 10 is a remote control utility to access any computer remotely with user’s permission to assist or to perform other tasks. 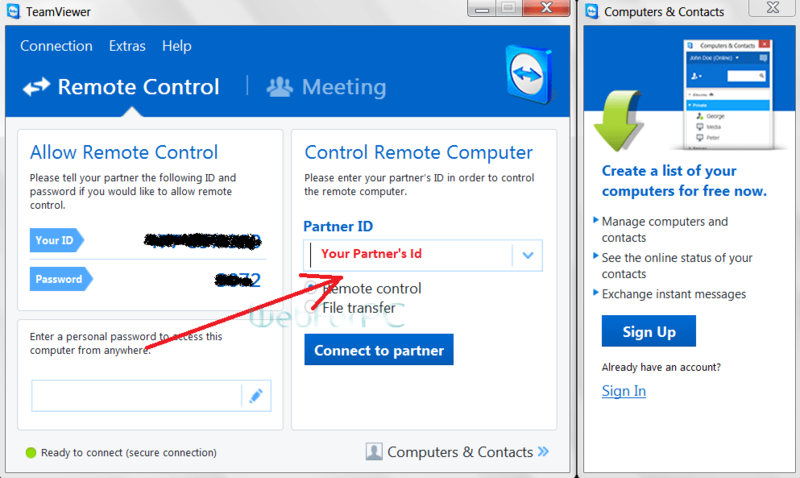 In addition to desktop control TeamViewer provided facility to share files between two computers and a chat session may also be initiated. Product is free for personal use and latest version 10 is equipped with many new features which you might be impatient to know if you have used this product previously. Version 10 is intelligently optimized as far as CPU consumption is concerned. Some additional control features are also added to make this product more attractive and a choice for many professionals as well as home users. Students can assist class fellows in completing different online projects and assignments. In addition to chat window voice sessions may also be initiated and assignments and other files also also transferable by choosing remote to local drive connection. In Version TeamViewer version 10 online meeting sessions and groups feature is added and another important enhancement is chat history recovery in a single click. Previous chat messages can be recovered to remember what you have discussed with remote partner. TeamViewer 10 is also optimized for best user customization on the part of administrator to setup the policies and control according to desire. Mobile and Linux support is also added, which has taken product to next level. You can connect to remote computer any where anytime. Servers are also in easy access with TeamViewer 10 and management be performed quite quickly.Management console is a featured one and easy to understand. If product is not updated, single click to update button under help section would let TeamViewer get updated, just within a minute. While accessing your server, Remote access is quite easy, and its practically experienced that TeamViewer remote connection provided better speed in comparison to VNC control. Mouse movements are also smoother and data transfer to and from remote PC is also secure and quciker. Whitelist feature is to add companies you trust in a complete list form to connect them any time. Here whitelist means, Users you trust. There is much to be talked about this amazing remote desktop control product, but for now we are listing some of the most remarkable features of TeamViewer 10. Update Here on: 22, September 2015. There comes many situations when you need to access your home computer, friend’s PC or Windows server to perform different tasks. TeamViewer provides easy access to remote desktop quite easily and quickly. So consider giving a product test for accessing remote computer. Click the download button below and product will start downloading immediately. Hi, may I request for team viewer version 8 please? TeamViewer 11 now available (https://www.teamviewer.com/en/download/current-version/). You may wish to update this page. I use this program(V11) for personal use (free) and find it very useful for accessing my computers remotely. They also have a Quick Support (QS) version of the program that is very useful when helping others (at a distance) with their computer issues. This is particularly helpful as you can control the computer remotely while talking to them on the phone or via video conferencing. If you have every tried to talk someone through how to do something on their computer when you can’t see their desktop you will greatly appreciate QS.